Clayton Archives - GetGoing NC! End of the 5.5-mile Johnston County line (for now). “Do you know how far this goes?” the grade schooler on the Razor scooter asked as he scouted the greenway. “It goes five and a half miles,” I said as I wrestled my bike off the roof rack. We were in a gravel parking lot off North O’Neil Street in Clayton, the trailhead for the Sam’s Branch Greenway. 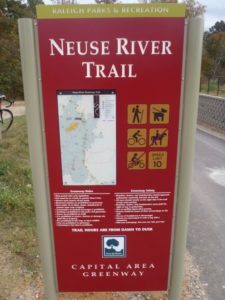 The 1.2-mile Sam’s Branch runs south, then east to the Neuse River, where it connects with a 4.3-mile stretch of now-open greenway that reaches the Wake County line, for a total run of 5.5 miles. There, a sturdy 3-foot-high wall of orange No Trespassing webbing emphatically blocks the trail, which was paved as far as the eye could see (about 200 yards). That stretch marks the beginning of Raleigh’s Neuse River Trail, a partially completed work-in-progress that eventually will run upstream for 28 miles to the base of the Falls Lake dam. The 5.7-mile stretch runs from the Johnston County line north to Auburn Knightdale Road. It’s scheduled to open in October. For those of you without calculators, that would be 11.2 miles of continuous greenway when the finished Auburn Knightdale stretch links with the Johnston County greenway. This section will be especially enticing for greenway users seeking solitude. Unlike the northernmost 6.5-miles stretch of the Neuse Trail, from Falls Lake dam downstream to the WRAL Soccer Complex, which opened last October, the southern segment travels through more rural, less-developed country. 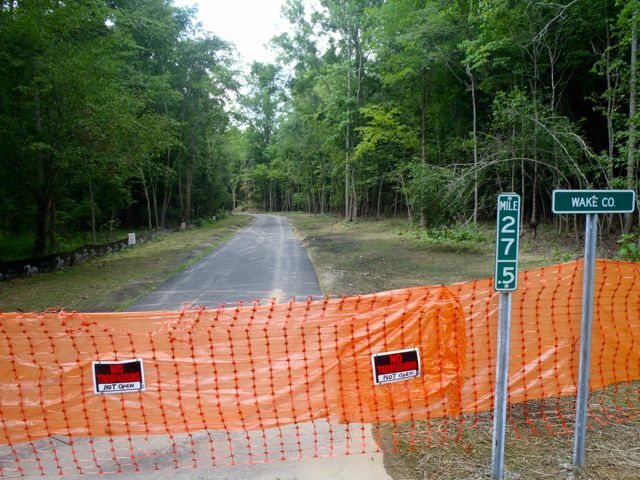 Check back Monday for a quick video escape down the new Johnston County stretch. And return next week for more updates on the Neuse River Trail and on Raleigh’s House Creek Greenway.